When you are first learning how to crochet, it feels like you have to stick to the easiest of patterns. As you gain confidence, you may try more complicated designs. I completely remember the first time I made the Divine Hat on Ravelry, the Flower Newsgirl Beanie by Polka Dot Posh, and the One Skein Lap Throw. I felt fancy. In retrospect, those patterns weren't too complicated, but there was counting involved and paying attention to how to place the hook to create the right stitch. The best part was how accomplished I felt. At some point, you gain enough confidence to start playing. By playing I mean going off the pattern or combining patterns. 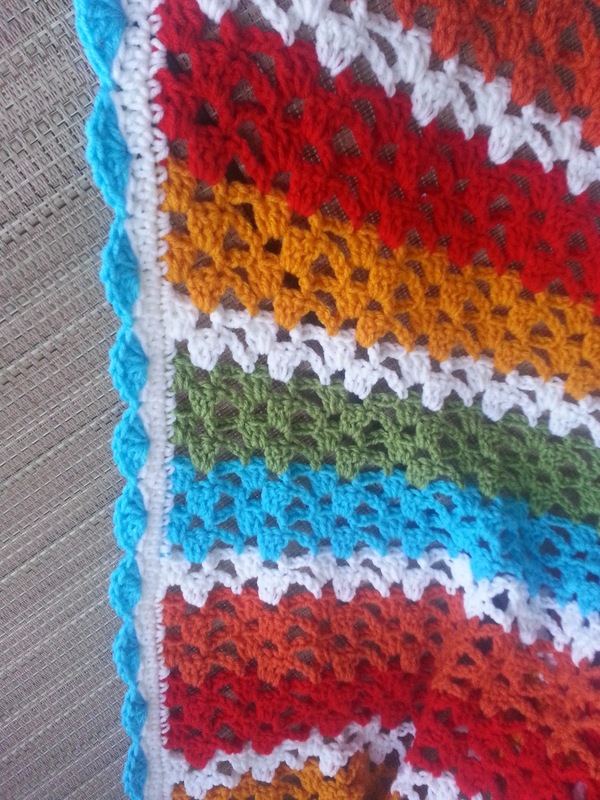 I've been doing that for a while now; using one stitch for the body of a blanket and two or three border patterns to create something unique for the border. It was pillow slip covers that really got me trying different things. 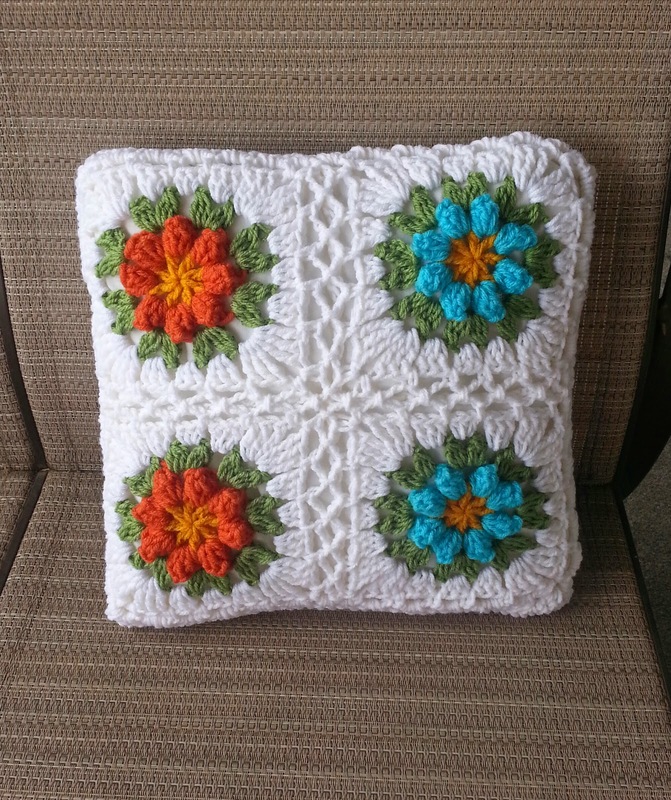 I made a flower pillow that combined a flower crocheted in the round, a pattern to change the round shape into a square, and then Cherry Heart's cushion back tutorial to finish up the slip cover. I've written about the pillows here. You can do this, too! I've used Pinterest to collect a bunch of different patterns I like and thought about ways I could combine them. One night, I found myself with quite a bit of yarn left from a Lacy Trellis blanket and thought I might try some of the patterns I had been pinning. I love Dada's Place Primavera flower square and knew that I wanted to try it out. Once I made one, I was hooked! I made three more without even noticing how far I had gotten. Then, after staring at the squares and wondering how I wanted to combine them, I went back to Pinterest and found a pin I had for a simulated braid join. 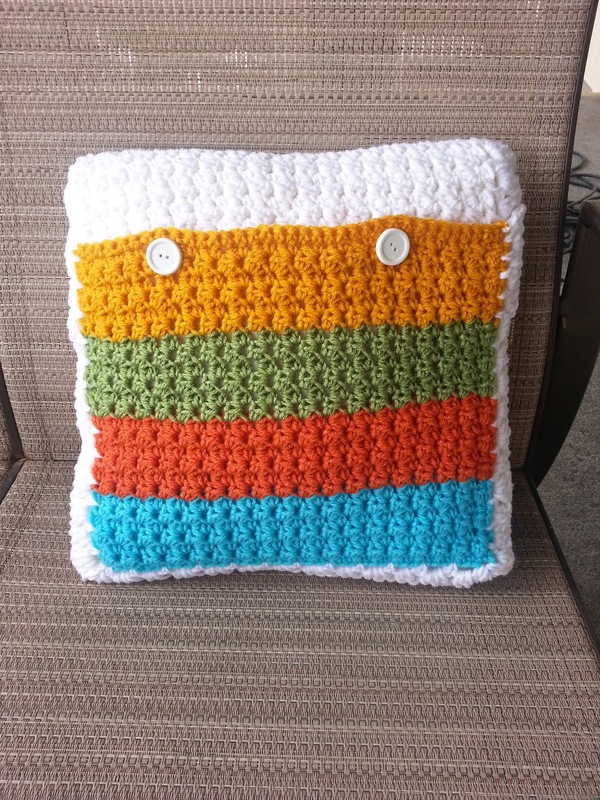 With a giant square created, I decided to turn it into a pillow. I used a simple pattern to create stripes across the back and used Cherry Heart's cushion back tutorial to create the overlapping pieces for my pillow slip cover. The result of all this experimentation and combination is this pillow. From the back. Buttons hold the overlapping pieces together to secure the slip cover. I'm in love with this pillow. 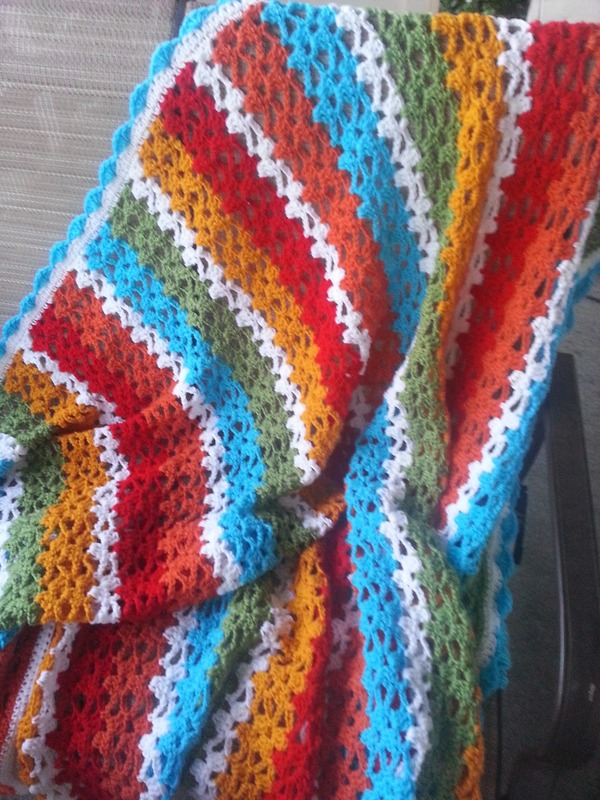 It will go perfectly with the blanket I made and it is seriously cheery. Why don't you try something like this? Pick two or more patterns you like and try combining them in a different way to make something unique. It will stretch your crochet skills and make you feel super accomplished. If you blog about them or post pictures somewhere, I hope you will share them! My friend, Caryn, has patiently waited her turn for a blanket. She chose the best colors; fun lively colors that reflect farmhouse vintage life. Using 6 skeins of Red Heart Super yarn, I created this massive blanket for Caryn to snuggle under during cooler summer nights. I can't wait to get this into the mail to Caryn!